This PDF 1.5 document has been generated by Microsoft® Office Word 2007, and has been sent on pdf-archive.com on 14/03/2014 at 10:37, from IP address 85.110.x.x. The current document download page has been viewed 708 times. File size: 897 KB (14 pages). increase the performance and recognize multiple notes in long duration. (WAV). Most of the records have 2-channel of 44100 kHz sampling rate and 16 bits per sample. trend as frequency increases. Here is the formula for finding nth key’s fundamental frequency key. 440 Hz is the frequency value of 49th key A4, the middle key. addition, C4 note has fundamental frequency of 260 Hz and harmonics of 260 Hz 520 Hz and so on. frequency content becomes more complicated. just a few samples by sampling theorem. 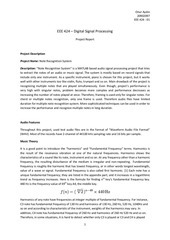 of this value is frequency range of human ears can hear is 20Hz to 20 kHz and according to NyquistShannon sampling theorem, sampling frequency must be at least two times bandwidth of the signal. Therefore, sampling frequency must be at least 40 kHz and 44.1 kHz is well enough. Framing is dividing the audio signals into small portions and then processing each portion separately. application, Hamming window is well enough, because; it suppresses side lobes better. fundamental frequency and just a few harmonics content can be observed. this way, content may become clear and decision performance may increase. By observing the band content in figure x, we can say that pushed keys are: 35th, 40th, 44th, 47th keys. are played. However, for G4, we need to decide whether it is pushed or it is just a harmonic of G3. amplitude. This technique is useful for if only one note is played, otherwise it doesn’t work. C3. Otherwise, C4 decision is kept. By this way, method’s success increases a bit more. Description: From C8 to A0, all notes are played in an order. lowest notes, harmonics become complex and number wrong decisions reaches to its peak value. Considerable amount of notes are recognized, there are some problems occur on lower notes. Description: From C4 to C6, all fundamental notes (C, D, E, F, G, A, B) are played in an order. error, but it is not really vital. Description: From C4 to C5, all fundamental notes (C, D, E, F, G, A, B) are played in an order. get perfect result. As a result, all notes are recognized perfectly. Description: A melody from Muse-Plug in baby song is played in piano from two different octaves. Test notes: Even if some important notes couldn’t be detected, success rate is considerably high. have longer bands and clear harmonics. recognized is as a harmonic of F3. Therefore, it is eliminated and correct result is obtained. very noise and complex record and just harmonics didn’t eliminated. Description: Two E notes are played simultaneously. therefore, it gives E3-E4 result. sophisticated, in limited time I tried to understand and observe the limits, difficulties and feasibility. optimally, but it is a drawback for usability. performance, but is also a drawback for usability. User can be able to correct errors after implementation. Each push can be standardized by an algorithm. Therefore, loss of notes can be prevented. 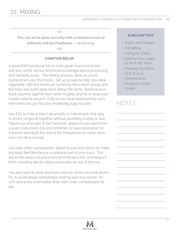 Directly using MIDI channel is a straightforward way and easier way for digital instruments. However, for analog instruments, this type of project is a necessity. This file has been shared by a user of PDF Archive. Document ID: 00151935.